Steer-by-wire tech and infotainment quibbles continue to let down a promising sports sedan. 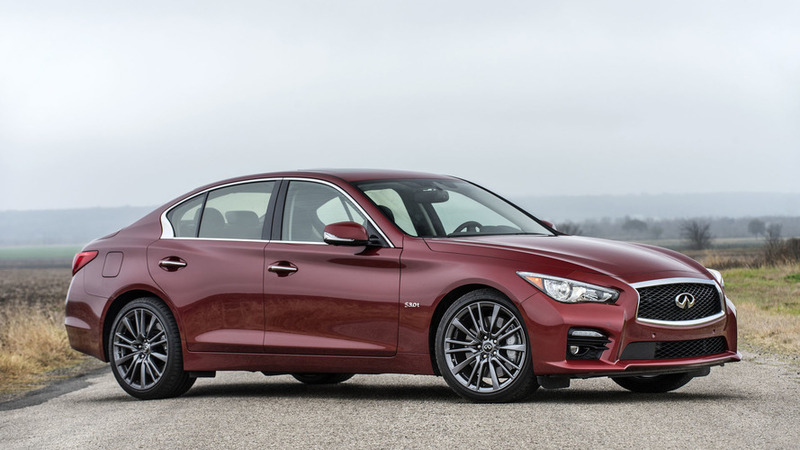 The 2018 Infiniti Q50 Red Sport 400 is trying so hard to lure car enthusiasts. It’s got the staple red-and-black color scheme, an enticing biturbo V6, carbon fiber accents, sport-tuned suspension, and rear- or all-wheel drive. What could possibly go wrong? Well, as promising as it sounds, the Q50 Red Sport is plagued by its steer-by-wire tech that keeps it from feeling like a true enthusiast’s car. There are very promising pieces to the Q50 Red Sport, but a few critical things hold it back from being a competitive sports sedan. Muscular styling. 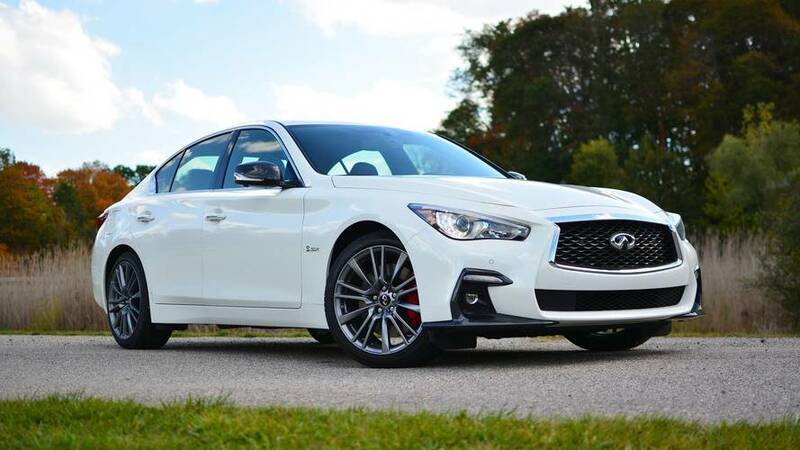 The Q50 Red Sport looks straight-up menacing. Angry LED eyebrows in the headlights give the Q50 a devilish appearance. It’s curvy and angular in all the right places. Out back, there’s a sporty, body-colored rear diffuser between two Red Sport-specific exhaust tips. 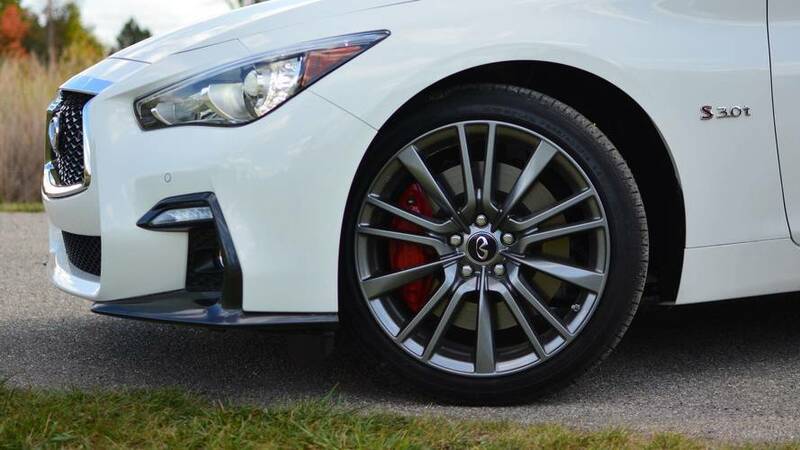 Unique 19-inch wheels with red brake calipers hiding behind them further differentiate the Red Sport from other Q50s. Optional carbon fiber bits on the mirrors and decklid spoiler are just icing on the cake. Pony up $400 and the front Infiniti badge even glows at night – a bit excessive for some, but something I grew fond of. Sweet, sweet power. Mash the throttle and the biturbo 3.0-liter V6 launches the Q50 with authority, putting out 400 horsepower and 350 pound-feet of torque. A seven-speed automatic transmission responds well to throttle inputs and can be manually operated with the magnesium shift paddles behind the steering wheel. Throw it into Sport or Sport+ mode and the Q50 becomes even more eager – throttle response sharpens and gears are held longer. Despite its turbo oomph, the Red Sport has a linear power delivery all the way to redline. Interesting safety tech. Opt for the Proactive Package ($2,700) and you’ll get a whole suite of safety and convenience tech. This includes well-known features like blind spot monitoring and adaptive cruise control, but with a twist. Ignore the audible and visual warning that someone is riding in your blind spot, start changing lanes, and Blind Spot Intervention will steer you back into your lane to prevent you from hitting that vehicle. Distance Control Assist lets you drive with only the gas pedal and will brake automatically in heavy traffic. If the vehicle senses you’re putting too much throttle input for the traffic conditions, the gas pedal will push back against your foot. It’s a little eerie at first, but something I came to appreciate on my morning commute. Don’t want these safety systems on? Turn them off by the press of a button on the steering wheel. Disconnected steering (literally). There is no mechanical connection to the steering rack, and, well, you can tell. Codenamed Direct Adaptive Steering (DAS), this drive-by-wire system digitally responds to steering inputs. At low speeds it feels especially weird with no true on-center sensation. Gain speed and the system increases in effort, but still feels vague when pushed in a corner. Unlike a hydraulic or electric rack, DAS transmits almost zero feedback from the road surface. Sport and Sport+ mode quicken steering response, but make effort artificially heavy in the process. Infiniti has made several updates to its DAS system, but still can’t seem to get it right. 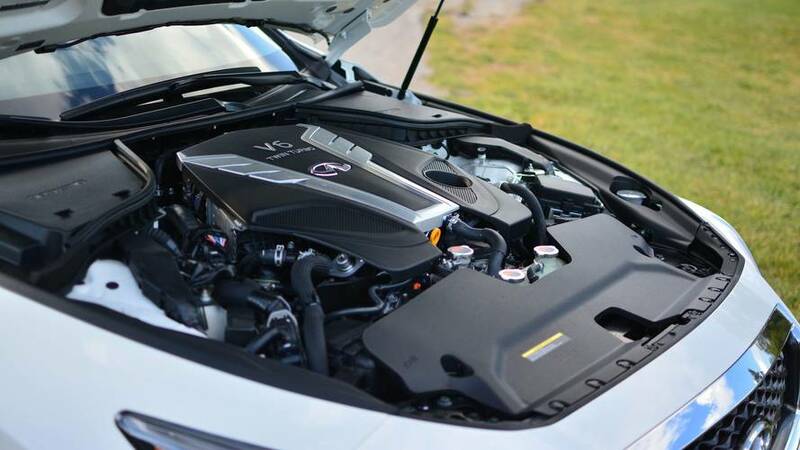 It’s not confidence inspiring and contradicts the eagerness of the powertrain. Noisy in the wrong areas. From 40 miles per hour on up, there’s so much wind noise I kept double-checking whether a window was cracked open. On the highway, there’s even more road and wind racket. Considering this is a $61,710 vehicle, I would’ve expected the Q50 to isolate the cabin from unwanted ruckus like a BMW 340i or Lexus IS 350 F-Sport would. Yet there’s little audible drama from the 400-hp V6 – if there’s going to be noise, I’d rather it be the good kind. Double trouble. 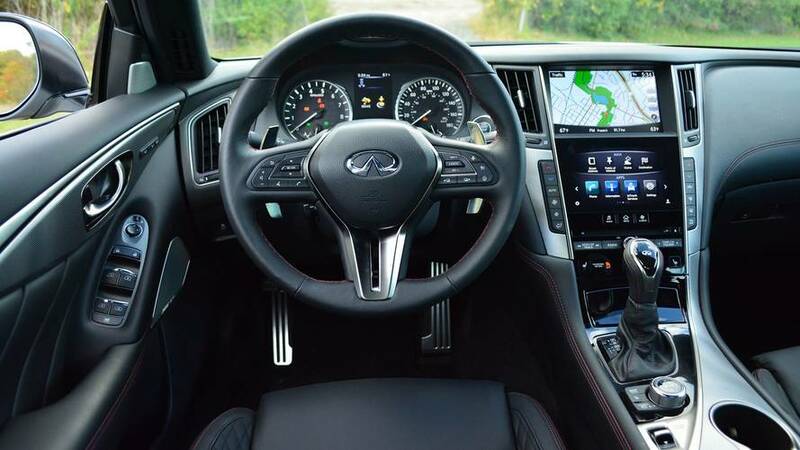 Infiniti gives you not one, but two touchscreens to fiddle with – too bad neither works very well. In theory, it sounds nice to have the navigation map displayed on the top screen and radio controls on the bottom one, but it’s a lot of information to take in at once. 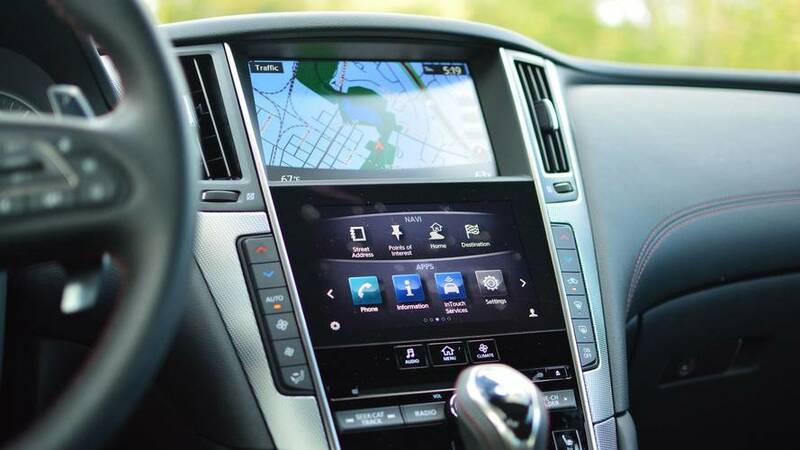 While the higher nav screen looks like an older Nissan infotainment system, the bottom display looks like it was designed by a completely different team. The bottom screen is farther away from the driver’s sight line and has slow response times, which make it difficult to quickly glance at and change the radio station, for example.